Rewatch the announcement on Facebook! OCEARCH and Jacksonville University are proud to announce a new collaborative partnership: OCEARCH at Jacksonville University. On February 9, 2017, our organizations came together in a shared love of research, collaboration, and exploration. Learn more about this new adventure below, or watch the announcement on Facebook. Jacksonville University (JU), founded in 1934, enrolls more than 4,000 students in over 70 programs and majors, from bachelors to doctorate degrees. JU, the oldest, largest private master’s university in northern Florida and southern Georgia, offers a range of degree programs from marine science and sustainability to engineering and aviation. 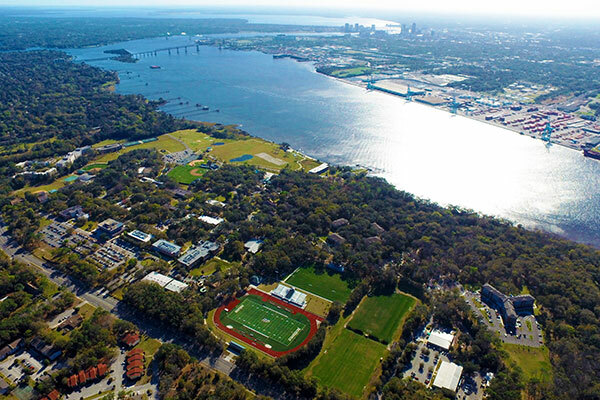 JU is located on the eastern shore of the St. Johns, its rolling 240-acre riverfront site renowned for its beauty. JU has graduated alumni from all 50 states and more than 90 countries. With a mission to prepare students for life-long success, JU emphasizes experiential learning, critical thinking and the collaborative approach. Read about some of our interdisciplinary research at Collaborate JU. The collaboration of Jacksonville University and OCEARCH creates a perfect fit between a renowned at-sea laboratory and a respected academic partner. Learn more about how OCEARCH at Jacksonville University will foster a wide range of new educational opportunities for not just marine science students, but for students of marketing, film, engineering, aviation, sustainability and environmental sciences. Q1: What is the Jacksonville University Marine Science Research Institute? Q2: Why are Jacksonville University and OCEARCH coming together? Q3: How will this partnership directly impact JU students? Q4: How did OCEARCH select Jacksonville University to be its new home? Q5: Where will the OCEARCH vessel be homeported? 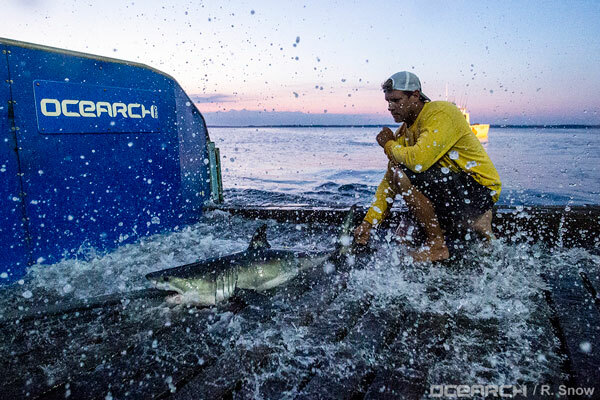 Q6: What will Chris Fischer’s role be with OCEARCH at Jacksonville University going forward? Q7: What exactly is a "cooperative partnership?" Q8: OCEARCH is currently based in Park City, Utah. Will OCEARCH move its whole operation to JU? Q9: With this new arrangement with JU, will the OCEARCH vessel continue to be available to other researchers and universities? Q10: How many expeditions does OCEARCH embark upon each year? Q11: How old is OCEARCH? Q12: How many sharks has OCEARCH tagged, in total, and currently following? Q13: Why is this research important? Q14: Will the sample collection and studies impact the shark’s health? Q15: What happens with the data that is collected from these expeditions? Q16: What is OCEARCH’s process for tagging a shark? Q17: What kind of samples does OCEARCH and its collaborating scientists collect from the sharks? Q18: What studies do OCEARCH’s collaborating scientists run from the samples? Q19: What type of tags does OCEARCH and its collaborating scientists use? Q20: What does the tracking data from the Global Shark Tracker tell us about sharks? A1: The LEED GOLD-certified Marine Science Research Institute (MSRI) is the center for JU’s research in marine science. With a strong foundation in biology, the program also incorporates elements of chemistry, physics and physical science, as well as life sciences, to further student knowledge of the environment and sustainable practices. Industry professionals in the MSRI perform diverse studies of local freshwater, estuarine and saltwater conditions, then work closely with professors and students to connect real-world concepts into the classroom. The MSRI’s prime location and direct access to both the river and Atlantic Ocean provides vast natural laboratories in which students can experience an unprecedented hands-on approach designed to foster success in a wide variety of undergraduate and postgraduate fields. A2: Jacksonville University and OCEARCH have formed a cooperative partnership to foster and promote unique opportunities for student-centric learning and meaningful scientific research. This partnership is grounded in the shared values of both OCEARCH and JU, as well as a shared emphasis on scientific inquiry, collaborative research, experiential learning, innovation and sustainability. In this cooperative partnership, OCEARCH will gain an institutional “home-base” and academic resources to continue to expand its mission to promote global conservation outreach, education initiatives, and scientific research. In addition, JU will be provided with a global platform on which students may experience a unique learning environment. A3: At its very core, this partnership’s purpose is to offer JU students unprecedented opportunities and foster experiential learning. Not only will students benefit from this collaboration at a classroom level, but they will also be at the forefront of high-caliber research as together JU and OCEARCH educate tomorrow’s leaders. The one-of-a-kind learning experiences this partnership will yield further expands the depth of JU’s already nationally recognized marine sciences program and MSRI. The new partnership with OCEARCH will also allow the University to expand the number and variety of opportunities for students majoring in other disciplines, such as sustainability, environmental sciences, engineering, aviation, communications and film. A5: The M/V OCEARCH will be homeported in Jacksonville, Florida. A6: Chris will join JU’s Marine Science Research Institute and its faculty as "Explorer in Residence." A7: A cooperative partnership is a collaboration between people united by choice and for the purpose of meeting common economic, social or cultural goals and aspirations, through an equally controlled organization. In other words, both JU and OCEARCH will work together to continue the groundbreaking research that fans of both JU and OCEARCH cherish. A9: Absolutely. OCEARCH at Jacksonville University will continue to support OCEARCH’s mission to open source data opportunities and scientific research globally. A10: OCEARCH holds 3-4 expeditions a year. A11: OCEARCH was founded in 2007, making this its 10th anniversary. As part of the natural maturity process of an organization, this is a perfect time to partner with an academic institution. A12: OCEARCH has tagged over 200 sharks and is currently tracking 185 sharks on the Global Shark Tracker. A13: In an effort to promote global conservation and educate the public, OCEARCH is gathering data that does not yet exist. The research that is collected from these expeditions is the first of its kind and is shared freely with the public through the Global Shark Tracker, allowing everyone to learn from the data collected. A14: No, OCEARCH works very hard to make sure sample collection has minimum impact to the sharks health. Physiological measurements show low levels of stress in the captured sharks. A15: OCEARCH is a leader in collaborative open source research, meaning that all of the data that is collected from these expeditions is shared in an open source environment with collaborating institutions that utilize it to conduct studies that are eventually published in peer-reviewed scientific journals. The papers, which can take 2-5 years to publish, are used to assist in policy decisions. A16: Sharks are caught from tenders using handlines and are guided by hand in the water on and off the lift. After capture, sharks are brought to the submerged platform of the M/V OCEARCH vessel and the platform is raised. Once the sharks are restrained and hoses of water have been set to enable the flow of oxygen, they are measured. SPOT, PSAT, and acoustic tags are attached. A17: Once caught, the sharks are measured, sexed and tissue, blood, fin clips, and parasites samples are collected. Small fin clips are removed with a pair of scissors; a muscle sample is removed from the flank with a 8mm biopsy punch and two blood samples are taken from the caudal vein. A18: With the samples collected during expeditions, collaborating scientists run studies such as the examination of fine and broad-scale movements, habitat use, site fidelity, residency, and feeding behavior of white sharks; assessment of reproductive condition, reproductive cycle, gestation period, and fecundity of sharks. A19: Most sharks are fitted with a satellite transmitter tag, PSAT tag, and an acoustic tag. In combination with the satellite tags, the PSAT tags will allow researchers to reconstruct three-dimensional movements of the sharks up to six months after deployment. The resulting data should shed light on the interactions between shark behavior and their physical environment. A20: The data allows us to see the range of shark movements in different parts of the world - their migration patterns - and helps us uncover the areas in need of protection. The data we’ve enabled has allowed scientists to figure out the mating and breeding sites of the species on the west coast of Mexico – Guadalupe Island. Scientists have also documented the first migration of Great White Sharks to the gulf, and the mid-Atlantic ridge.